Holiday Roast with a plum & cinnamon sauce. 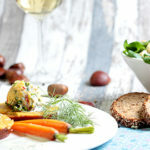 Together with mit baked apples, colourful winter vegetables, sesame potatoes and lamb’s lettuce with a lemon-pumpkin oil dressing with croutons and walnuts. With baked apples, colourful winter vegetables, sesame potatoes and lamb’s lettuce with a lemon-pumpkin oil dressing with croutons and walnuts. Place the dried prunes in some red wine overnight. Then halve them. Heat up 200 ml of water, soy sauce, the cinnamon stick and the rest of the red wine and boil the prunes in the mixture. Remove the cinnamon stick. Slightly thicken it with some potato starch and season with some soya cream. Warm up the roast in it (or heat up the roast in the oven, after drizzling it very little oil). Take an apple corer and clear out the apple from the stem to the bloom. Leave enough around the edges and don’t poke through the peel. Mix the hazelnuts, marzipan, sultanas, golden syrup and some apple juice to a solid mass. Fill the apples with the mass and bake in the oven for 10-12 minutes at 190°. Throughly wash the vegetables, peel and clean them and then cut them into evenly sized bits (apart from the Brussel sprouts). Steam the vegetables until they are firm to the bite and flavour with some vegetable extract. Place some backing paper on the baking tray and oil it up. Then sprinkle the sesame seeds evenly on the tray. Halve the potatoes and place them down on the tray. Bake in the pre-heated oven (at 200°) for about 20-25 minutes. Clean the lamb’s salad thoroughly. Leave the salad to drain well. Gut the toast bread into evenly sized small cubes and toast in a pan (no fat needed!). For the dressing, mix the pumpkin seed oil, the lemon juice and a pinch of salt and sugar. Place the salad on a dish, dazzle with the dressing, sprinkle the diced toast and the halved walnuts over the salad. 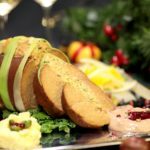 Slice open the holiday roast and place on a platter together with the side dishes. Pour the prune sauce over the roast.